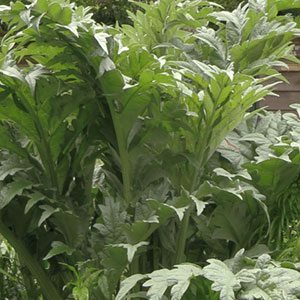 A large leafy foliage plant, or a useful vegetable, the Cardoon has been both over time. Originally from the Mediterranean where it was used as a vegetable, it also has claims as a medicinal plant, while others call it a weed. This large plant is related to the Globe Artichoke, it does have a few spikes on it and it does need room to spread to allow the foliage to be shown off to its best. Although the foliage or stalks are eaten, they are a little bitter, so if you are intending to eat the Cardoon, try blanching the stems before you harvest. This is fairly simple, wrap the lower part if the foliage in hessian, cardboard or whatever will keep the light out, and then leave it for a month. You will still need to prepare it, and lots of recipes for Cardoon gratin are available. For us it is a striking architectural plant with bold foliage. It can take pride of place in the garden border as it does reach a good height. The stems are arching, and with attractive green to blue foliage it has impact. Although this is a plant from a Mediterranean climate, it does like good soil and some moisture. Plant it in a good humus rich soil and it will require very little attention. It will flower, with large thistle like flowers and this is where we step in. The flowers are pruned away a few days after they open and are disposed of (not composted). This prevents self seeding and makes the Cardoon a friend to all. Spread – Will spread to around 1.5 metres. Foliage – Green to blue.